Essential Travel strives to bring you the best protection for your holiday and this includes offering protection for your vehicle. Now you can purchase roadside assistance cover for any travels within the European Union - including the UK. We have joined forces with StartRescue to offer you reliable roadside assistance for Europe. Travelling to Europe on a road trip with friends can be a great experience. Not only are you free to explore the landscapes and sights from the comfort of your vehicle, but also have the freedom to be more spontaneous and flexible with your plans. 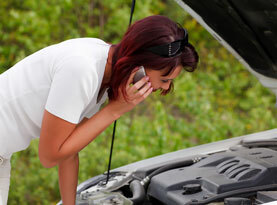 Don't be deterred by the possibility of running into car trouble. Essential Travel's partnership with StartRescue means that you can book affordable European cover and roadside assistance at the click of a button. Car accidents and vehicle breakdown can happen anywhere. The last place you'd want to find yourself in such a situation, however, is when you're on holiday or heading on an important business trip in a foreign country. Avoid the hassle of arranging last-minute roadside assistance while in Europe by booking your breakdown coverage through Essential Travel and StartRescue. Request a quote with Essential Travel and receive peace of mind for your European and local road trips.